See the all new email list for former USCGC Taney Crew. Click here to join the email list, and chat over email with your former crewmates. The standard watch on board ship was 4 hours. Beginning at midnight the ship's bell was tolled each half hour up to eight bells, then the process repeated. s\vern toler CLICK ON THE CHAPETER BELOW THAT YOU WISH TO SEE; THE CHAPTER'S ARE CALLED "Bells"
1 Bell: Introduction, including Sister Ships. NEXT REUNION . 3 Bells: Copies from publications related to the Taney. 4 Bells: Stories submitted by USCGC TANEY crewmen. 7 Bells: Sailing List Reprints from old Taney Ship rosters. 8 Bells: Shipped out. Memorial to deceased shipmates. PLEASE CONTACT WEB MASTER TO ADD TO THIS LIST. TANEY web page, Garret Conklin is the new Web Master, people who wish to contact Vern Toler about the TANEY Phone 360-652-3701 or e-mail me at vern@armory.com or <vern_toler@yahoo.com> (NOTE vern_toler is connected by an underline) don't panic if ISP "armory" is down, it is operated out of a young couples home and they have to work regular jobs, they do a great job with the armory ISP. E-mail received is copied and added to the web page. Vern gets help from his grandson "Chris", <taz@armory.com> for this is update information on the Taney Reunion, from . Thanks to Chris for the latest improvements of the Taney web page and for setting up the format used for the Taney Web pages..
Next Reunion Pending watch this space for update, if you wish to suggest a time and place please contact Garret. A special run of high quality "zippo" lighters with Taney Picture and name, created special for the last reunion, there are a few left and they can be purachaced from Garret. IMPORTANT NOTICE: George Blessing, founder of the Taney Association and Garret Conklin, Host for the 2001 reunion have volunteered to take over the USCGC TANEY Web Page, with the help of my grandson, Chris Petrell. I will continue to work on the Taney Page until the transition is complete. They will be a great asset in keeping the Taney page alive, as I am getting too old to maintain it properly. Please keep sending information and check the page often for new information. Note: Blessing lives on the East Coast and Garret lives on the West Coast, Regional lunches are in the planning stages for Taney shipmates and other Coast Guard friends and shipmates. Thanks s/your shipmate vern_toler. 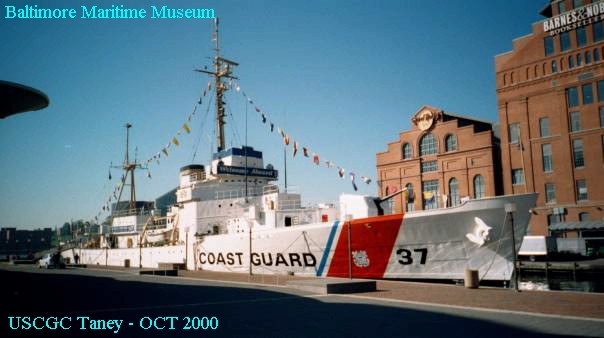 Please feel free to copy any information on this web site and feel free to create your own web site for the USCGC Taney. Vern Toler is at the age that he could ship out on his final cruse. "8 Bells" Addition web masters for the USCGC Taney will keep the history of our ship alive. Please feel free to contact George Blessing, GarretConklin or Vern Toler at any time. Below are be links to other sites of intrest to military and ex military. http://www.militaryliving.com Military Living for active & retires, Maps and reports for military travlers.